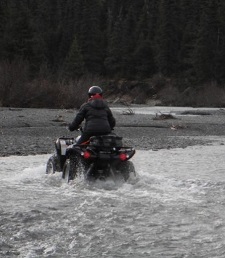 Crossing streams or rivers may be necessary for hunting, fishing, recreation, and access for other reasons. If the stream or river is known to support anadromous fish , the physical act of driving through the gravels can affect sensitive life stages of fish (e.g., salmon eggs, juvenile salmon, overwintering resident fish) and disturb migrating adult fish on their way to spawning grounds. Crossing rivers, streams, and lakes with vehicles or equipment in summer and winter may require a Fish Habitat Permit. Many commonly used crossing locations are authorized by General Permits. Division of Habitat staff can help you determine if your crossing will require authorization and assist you in planning a trip that will be safe for you and for fish. Please contact the Division of Habitat office closest to your location if your crossing area is not already authorized by a General Permit.